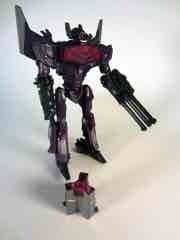 As characters go, Shockwave gets few toys. There's no "Classics" version of the character, but there were a couple of movie toys, a really nice Animated figure, and a couple of others. 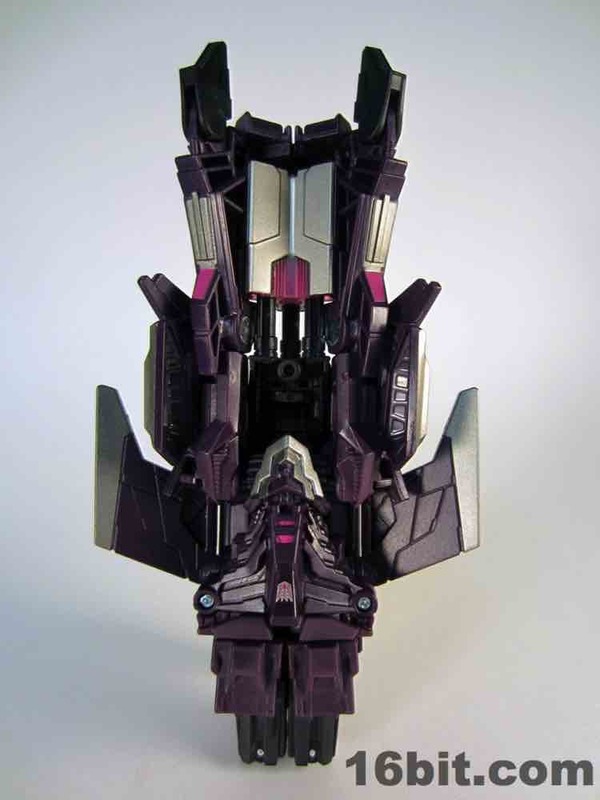 As this design from Fall of Cybertron has been co-opted by IDW for the new G1 comic book, the figure can serve multiple purposes in your collection. 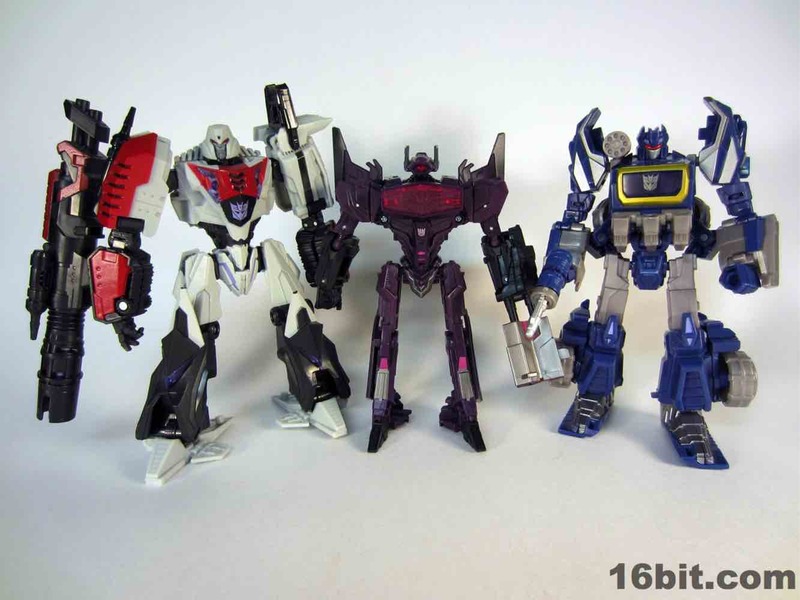 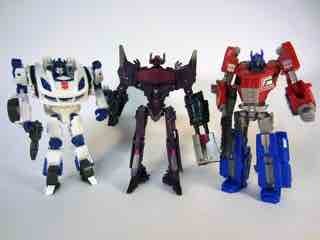 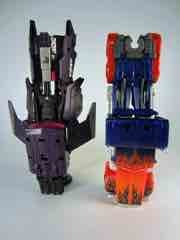 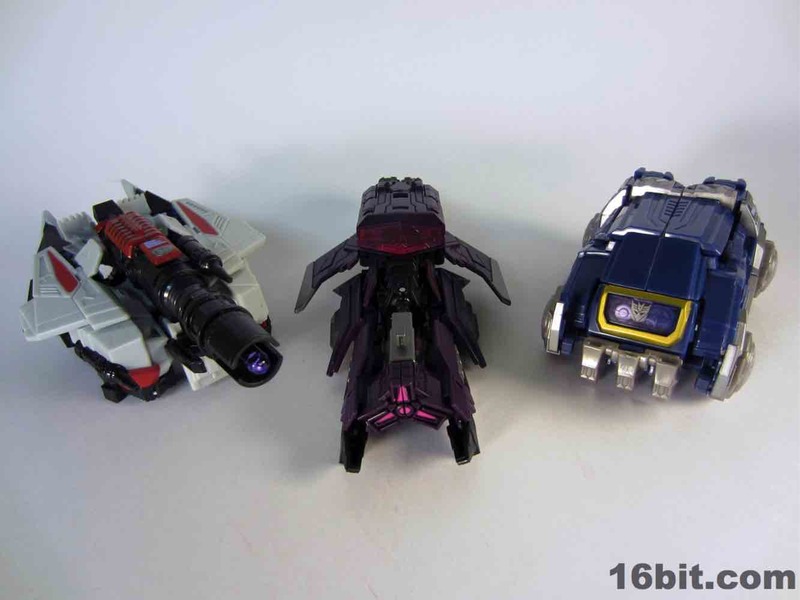 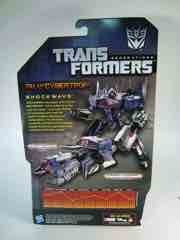 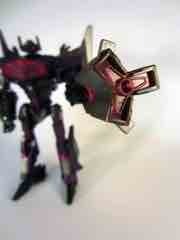 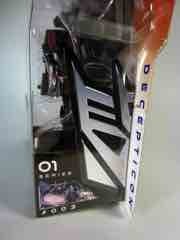 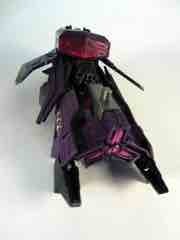 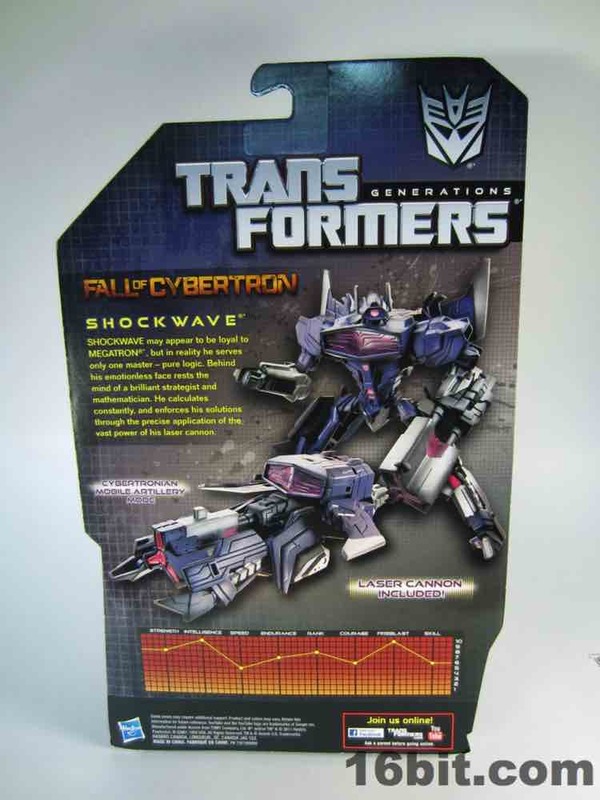 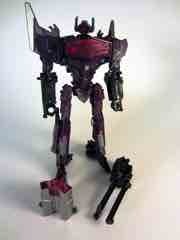 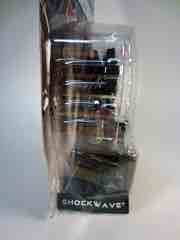 Heck, in Japan Shockwave will be part of the Transformers Prime line. 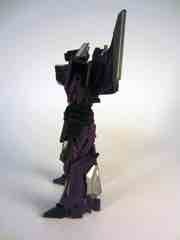 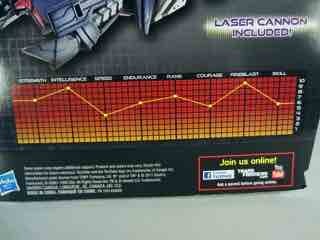 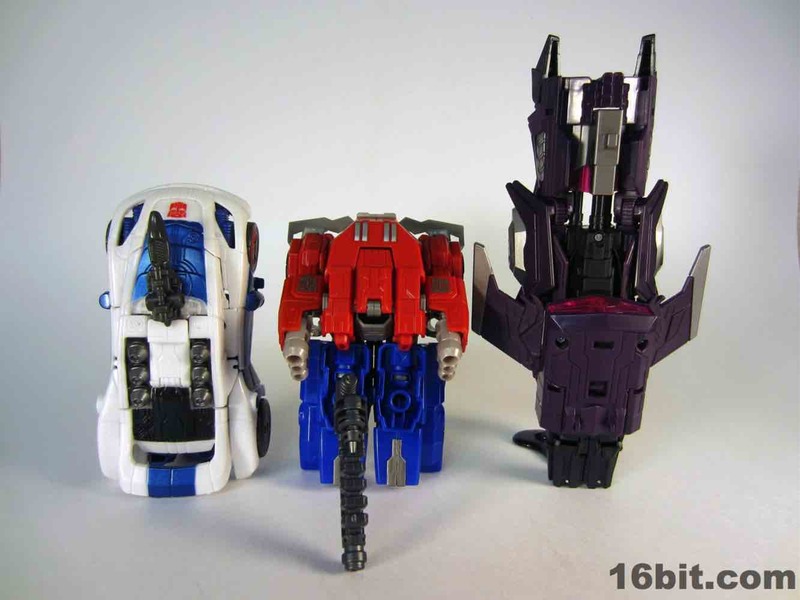 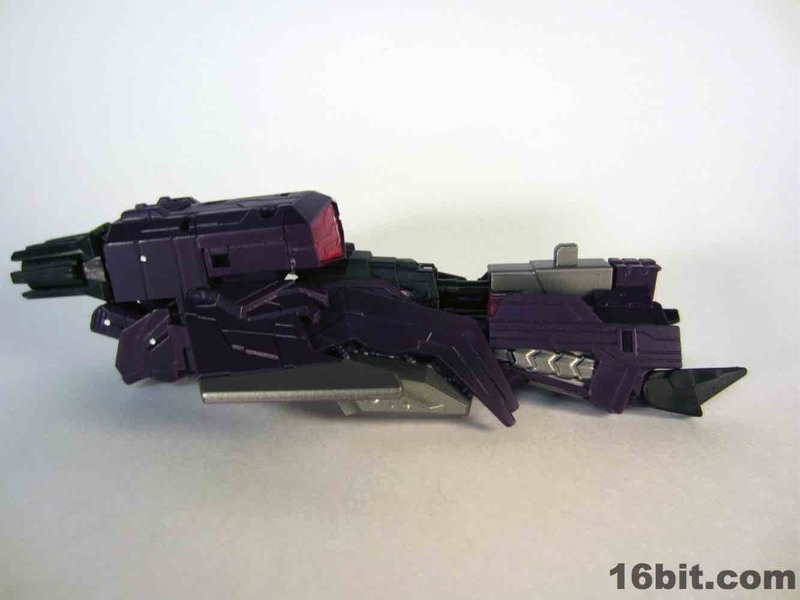 Because he is being used for no fewer than 3 possible functions, statistically you should want to pick up this figure. He'll go on one of your shelves. 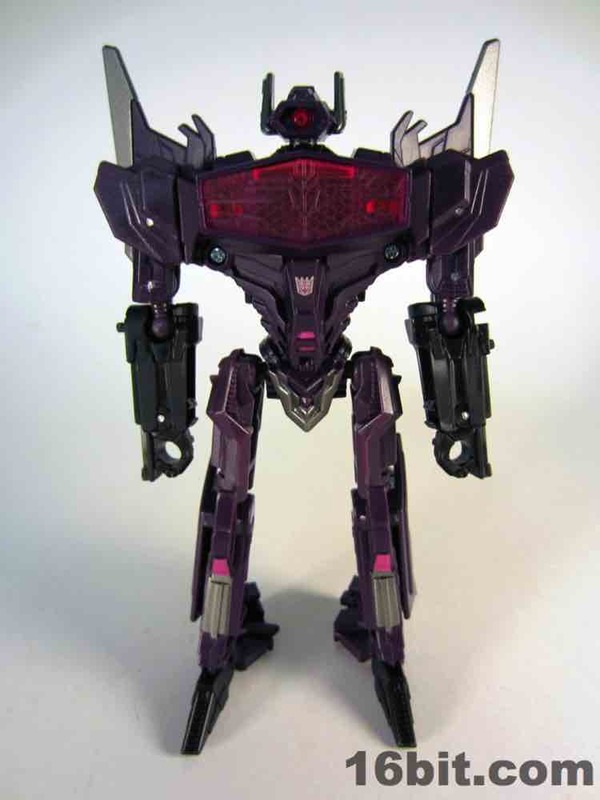 While a thinner robot, this one feels like the best out of the initial 3 non-combining toys from this new assortment. At 5 1/4-inches tall he has a few fun features, although it's worth noting that the arm-mounted cannon is difficult to pry off. 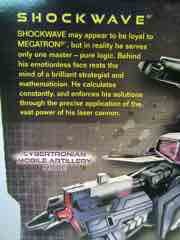 The "Evil Spock" of the Transformers galaxy is nicely represented by this toy. 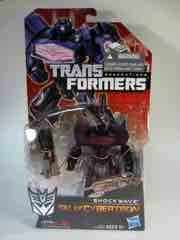 Packaged in robot mode, there's no mistaking Shockwave for anybody else. The single eye is now pink, and the character retains the familiar chest shape. His single barrel gun arm has been replaced by a triple-tipped weapon of death, which can be capped by another laser amplifier of some sort. Shockwave's weapon can be held by a 5mm peg in his fist, or connect to his arm through a longer peg. 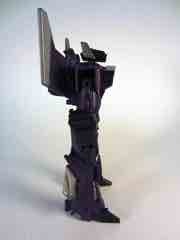 It's pretty much going to stay on once you plug it in, so be warned. 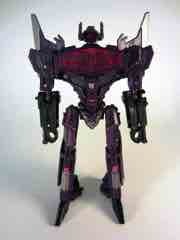 He feels a little more substantial than Optimus Prime and Jazz, plus he sports about 13 points of articulation. 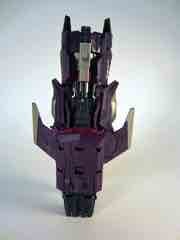 His neck joint is incredibly stuff, but it will swivel if you're careful. 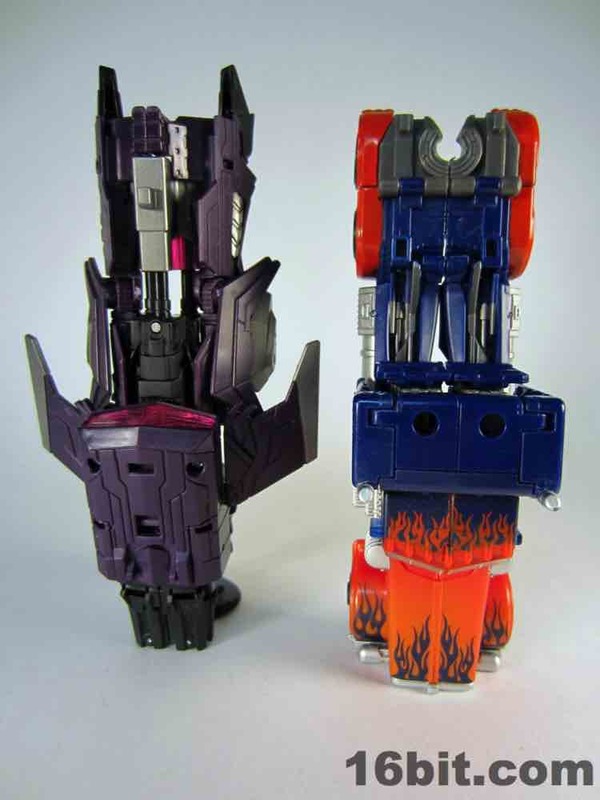 For those wanting to arm this monster to the teeth, he has a peg hole on his back on which you can plug in his weapon or other Energon weapons, MechTech guns, and other goodies. 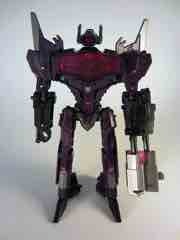 While his robot mode isn't a pure G1 update, it's close enough where I'm pretty happy with it. 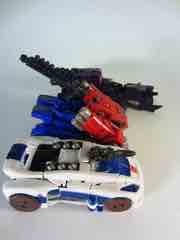 The transformation is mostly pain-free, plus it has a few fun bits. The most fun I had with it was finding out he has a spring-loaded head which pops up when converting the space vehicle into the robot mode. 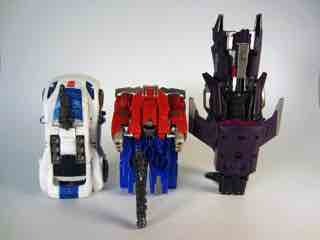 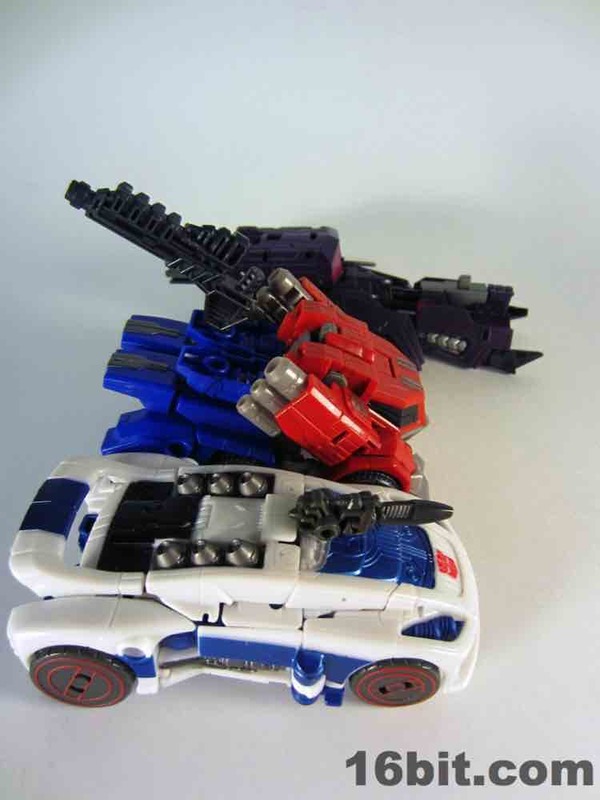 (Hasbro was really keen on special head reveal features as a part of the transformation from the 2008 Universe lineup.) The least enjoyable.shtmlect of conversion was getting his legs into vehicle mode as they have to wrap around and plug into his weapon just so, and it feels a little forced at the end. 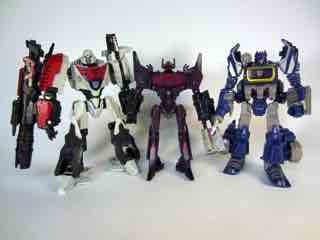 Still, it's nowhere near the trial of Jazz. 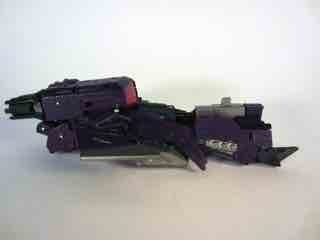 The big goofy space gun thing is neat, and for some reason it reminds me of some sort of alien dog head. 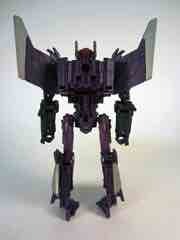 There are no action features, firing weapons, spring-loaded specials, or landing gear. What you see is what you get, and the detail carries over from the robot mode. An abundance of panel lines coat the figure and he has so many sliding panels and rotating wings that I noticed a few galleries online actually have him mistransformed, getting his arms just right can be a little tricky as well. 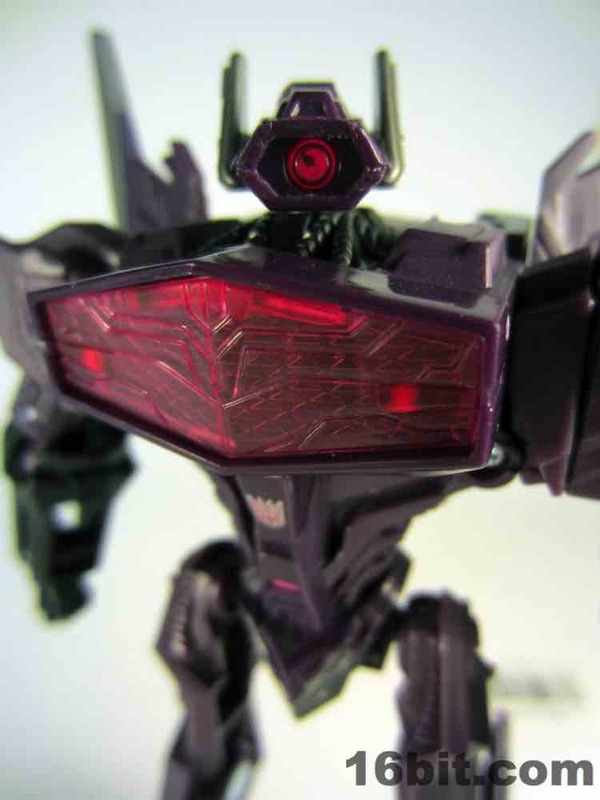 I wish it did a little more, but well, it's a collector figure. 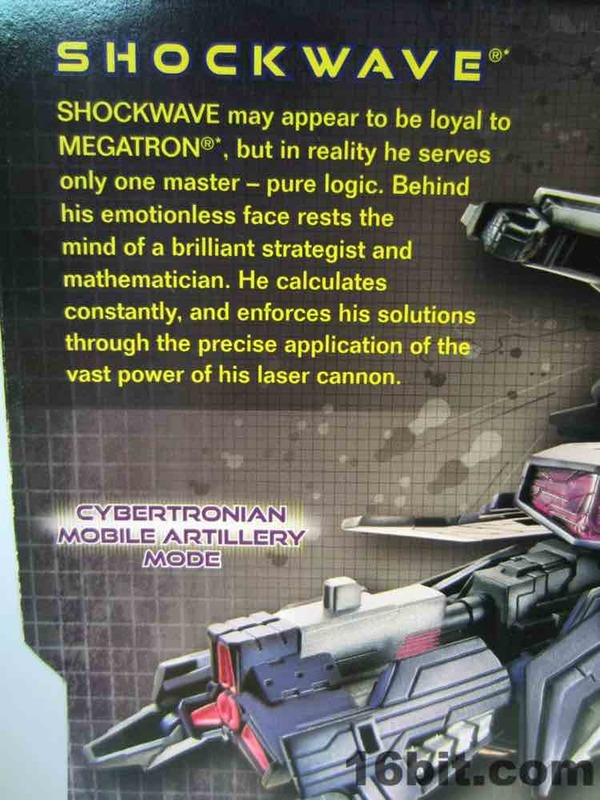 That's Hasbro or Mattel code for "we can charge more and it doesn't necessarily have to be a fun toy." 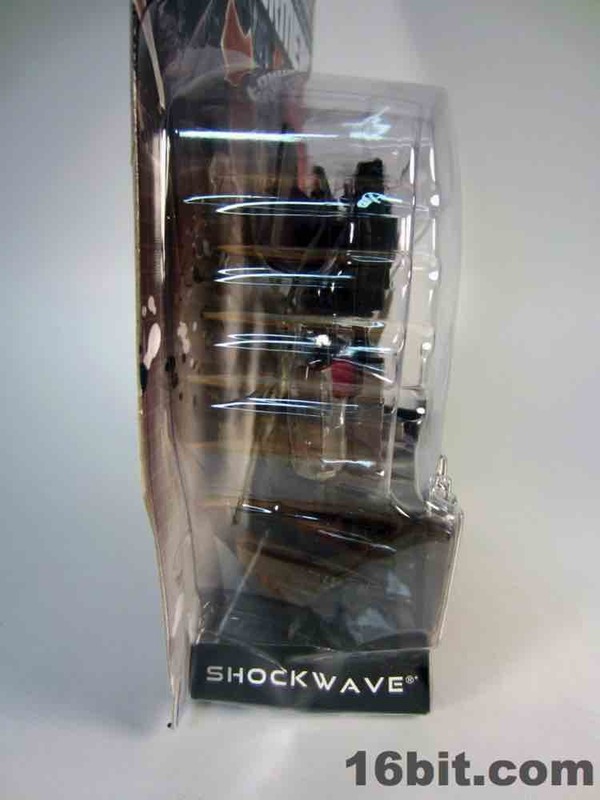 It looks cool and it's going to be fantastic on your shelf or desk, but it lacks a fun light-up gun or some other funky little thing to fidget with. 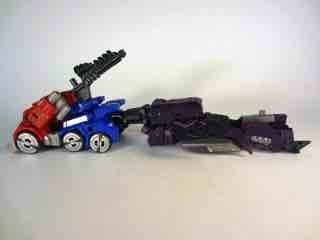 If you're old, you'll like this. If you're a little kid, I could see being bored with it unless you were totally on board with the character or the video games. 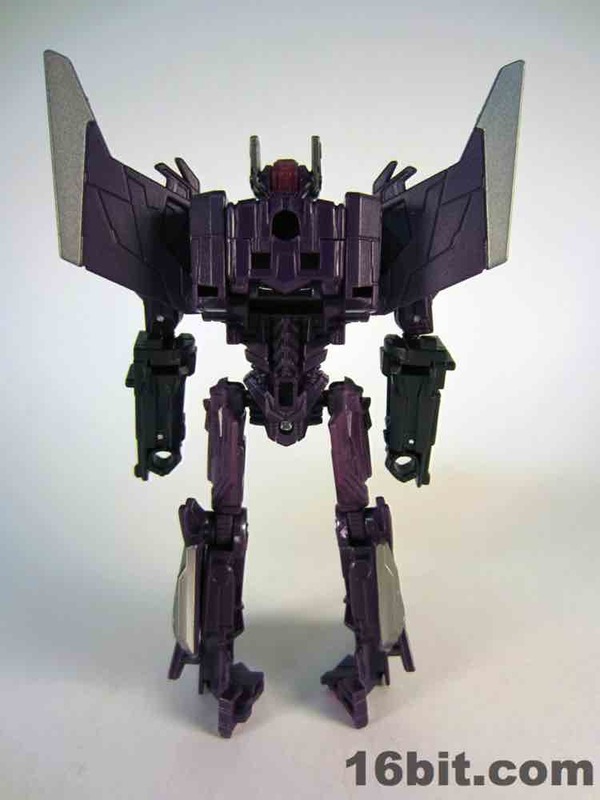 In 2013, this figure will be remolded into Air Raid-- or Fireflight-- Hasbro has displayed the prototype with both names so far and I guess it could go either way. 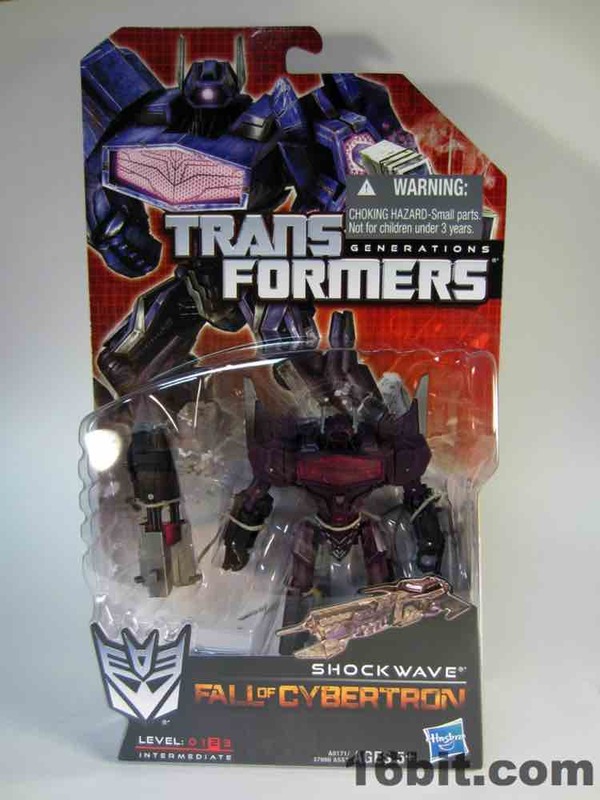 Due to some weirdness surrounding the remold, and the fact I like Shockwave, I'd say grab this purple release when you get a chance. 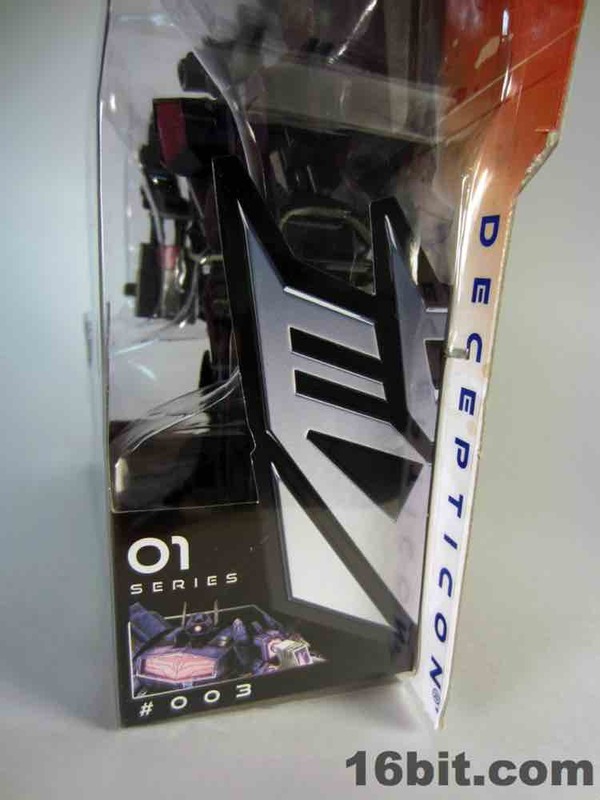 He's probably worth your $15, although I might not be as enthusiastic if his alt mode were applied to a character known for sounding less like David Warner.